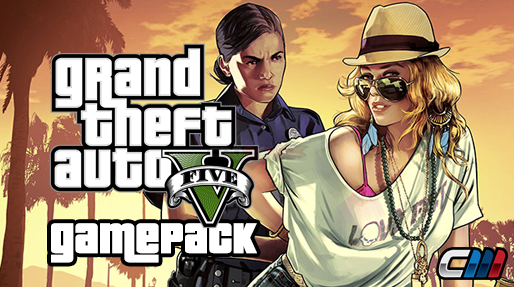 The Grand Theft Auto V GamePack for CronusMAX PLUS has 10 distinct classes including Primary Rapid Fire, Secondary Rapid Fire, Auto Arm Wrestling, Auto Aim, Turbo Melee and Easy Jog & Sprint. When this GamePack is being used on a PlayStation 4 and detects the connected controller is not a DualShock 4, it will automatically reassign Touchpad to the Select/Back/View Button. Press Select + Left Analog Stick (L3) together. Press Back + Left Analog Stick (LS) together. Press View + Left Analog Stick (LS) together. Player LED 1: Controller in regular mode, the GamePack is Disabled (Blue on DS4 / CronusMAX PLUS Backlight LED). Player LED 4: The GamePack is Enabled (Pink on DS4 / CronusMAX PLUS Backlight LED). All GamePacks have mods that can be tuned and customized to your own preference. This is what makes the CronusMAX so powerful and extremely popular with the gaming community. 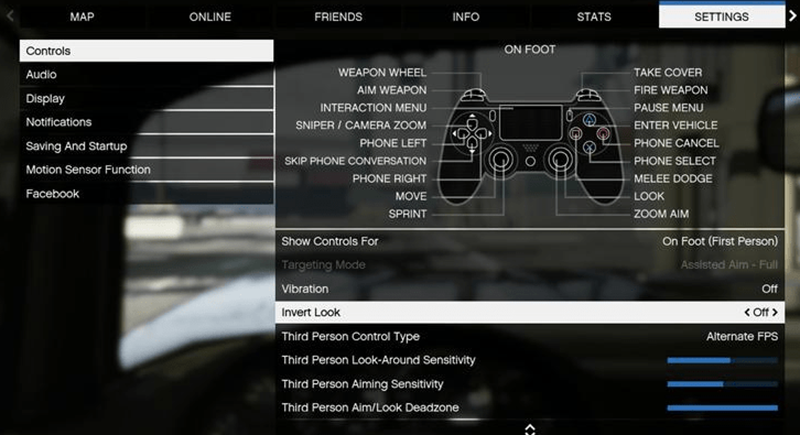 The settings are usually made using the controllers built in GamePack Menu Mode, as explained below. However, there is a much easier and quicker method via the new GCI (GamePack Configuration Interface). 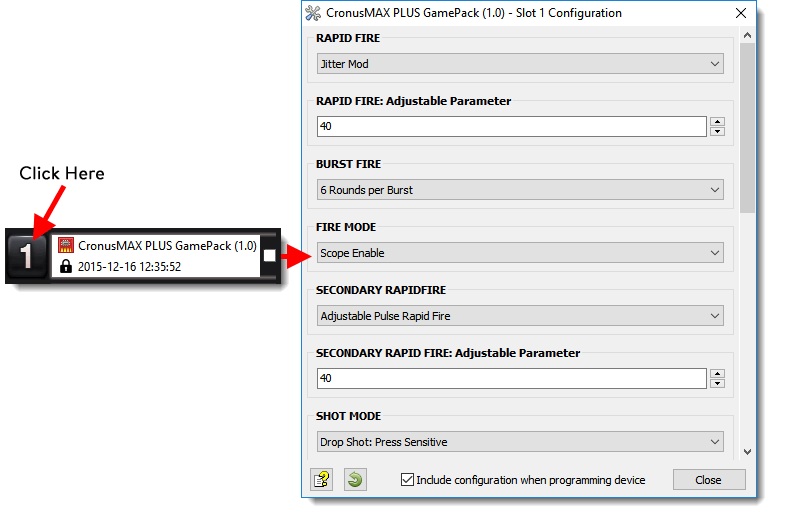 Pre-configure your GamePack settings using the GamePack Configuration Interface (GCI) in the Cronus PRO software. The GCI opens automatically when you load a GamePack to a memory slot, or you can simply click on the memory slot number to the left of the loaded GamePack to open the GCI. As soon as you select your preferred settings, close the GCI and click the PROGRAM DEVICE button. To select the GamePack you wish to use on your console, press the Memory Slot button on the CronusMAX PLUS so that it highlights the corresponding number on the LED (so if you have a GamePack loaded to Memory Slot 1, the LED on the CronusMAX PLUS should display the number 1). Note 2: The Menu is navigated via the CronusMAX PLUS LED System and also the controller's Player Number LED's if available. It is not an on-screen menu. Click Here for an instructional video. Hold SELECT+START for 2 seconds to enter menu mode. Hold BACK+START for 2 seconds to enter menu mode. Hold VIEW+MENU for 2 seconds to enter menu mode. Always keep the SELECT / SHARE / BACK / VIEW button pressed while in Menu Mode. To exit Menu mode, release the SELECT / SHARE / BACK / VIEW button. Player LED 4 will blink the number of the current Class (DS4 / CronusMAX PLUS Backlight LED will flash Pink). Player LED 3 will blink the number of the active Mod for the current Class (DS4 / CronusMAX PLUS Backlight LED will flash Green). Note: If the Player LED 3 is not blinking, it means either no Mod is loaded/disabled or the default setting is selected for the current Class. See below for instructions how to navigate between Classes and Mod's. If you have an Xbox One Controller, the Right Trigger will rumble the number of the current Class (CronusMAX PLUS Backlight LED will flash Pink). If you have an Xbox One Controller, the Left Trigger will rumble the number of active Mod for the current Class (CronusMAX PLUS Backlight LED will flash Green). You can adjust Rapid Fire speed and test your settings within the game menu and with each weapon without having to set/save/restart every time to test each setting and each weapon. This is a new awesome feature that allows you to optimize your weapon's settings on-the-fly saving you a TON of time! (In Menu Mode: LB/L1 Reduce Value Increases Rate of Fire - RB/R1 Increase Value Reduces Rate of Fire - RT/R2 Test). This Rapid Fire is optimized to be as fast as possible but at the same time ensures that every single shot is correctly registered by the game. Fire mode determines an assist action to be used together with Rapid Fire. These are normally applied to the triggers. The aim (ADS) disables the Primary Rapid Fire. The aim (ADS) enables the Primary Rapid Fire. The Primary Rapid Fire will only be activated by fully pressing the fire button. If Secondary Rapid Fire is enabled it will take place when the regular Rapid Fire is not actuating. For example if your regular Rapid Fire is only active when scoping then the Secondary Rapid Fire will be activated when you are not using scope. This behavior can be very handy to set a precise rate of fire while aiming and a more aggressive rate of fire while hip firing. You can adjust Secondary Rapid Fire speed and test your settings within the game menu and with each weapon without having to set/save/restart every time to test each setting and each weapon. This is a new awesome feature that allows you to optimize your weapon's settings on-the-fly saving you a TON of time! (In Menu Mode: LB/L1 Reduce Value Increases Rate of Fire - RB/R1 Increase Value Reduces Rate of Fire - RT/R2 Test). This Secondary Rapid Fire is optimized to be as fast as possible but at the same time ensuring that every single shot will be correctly registered by the game. This MOD compensates for vertical recoil while firing a weapon by automatically moving the control stick in the opposite direction of the one your gun is moving while firing. The adjustable parameter sets how much the compensation should be. You can now adjust Anti-Recoil and test your settings within the game menu and with each weapon without having to set/save/restart every time to test each setting and each weapon. This is a new awesome feature that allows you to optimize your weapon's settings on-the-fly saving you a TON of time! (In Menu Mode: LB/L1 Decrease Weight - RB/R1 Increase Weight - RT/R2 Test). If your weapon is moving UP when you fire, you need a LARGER number in the adjustable parameter. If your weapon is moving DOWN when you fire, you need a SMALLER number in the adjustable parameter. Sometimes in GTA V, you need to press the 'Melee' button repetitively. This MOD automates this task by assign a turbo mode to the Melee button. Once activated, all you need to do is press your melee attack button. Get ready for knife kill sprees. Win every Arm Wrestling mini-game. This MOD automatically moves the analog stick left-and-right as fast as possible. Activate by pressing and holding the R3/RS button for 2 seconds. Deactivate by quickly pressing and releasing the R3/RS button. 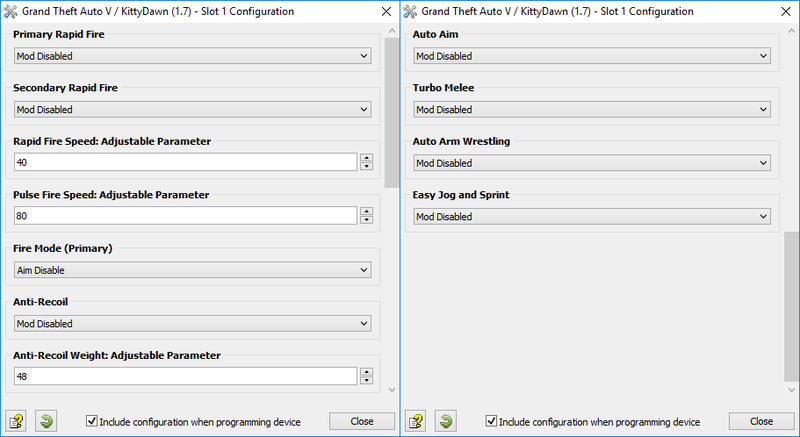 If you are tired of constantly pressing the left analog stick to make your character sprint, Auto Jog & Sprint is just what you have been looking for. When using a non-DS4 controller on a PlayStation 4, the authentication will timeout after 10 minutes and the signal will reset between the console and the controller (If you are not using the latest CronusMAX PLUS 1.20+ Firmware Update and a USB Hub). This only takes less than a second but can interrupt gameplay. You have the option of being notified when the controller authentication is about to timeout so this gives you time to prepare so you're not caught in a compromising position. You can choose to either be notified by LED 4, the CronusMAX PLUS Backlight LED or Trigger Rumble (See Class 2). The LED flashing and trigger rumbles will become more frequent the less time you have until an automatic reset will occur. 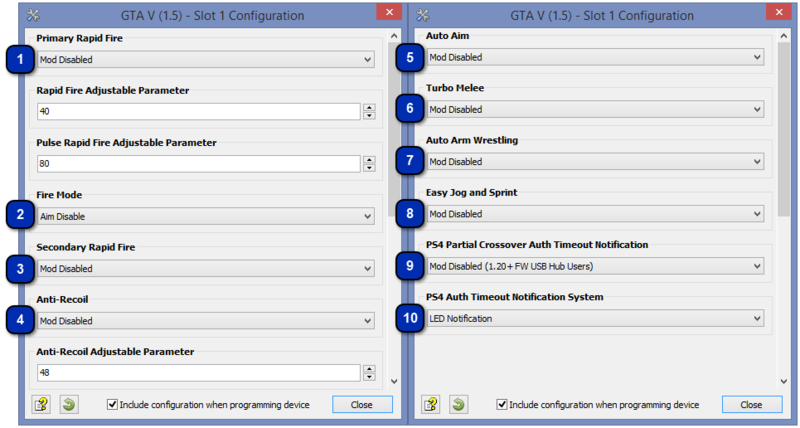 You can set this MOD to start notifying you X amount of Minutes and Seconds from when the Auth Timeout will occur. You can hold back/select/view and press A/Cross to manually reset the authentication timer. This MOD is not required if you are using a USB Hub for PS4 Full Time Cross Over Support. 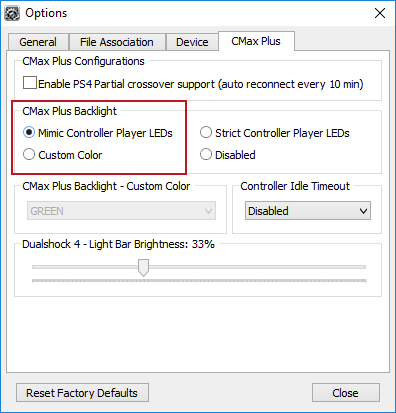 Green - If you are using a CronusMAX PLUS firmware v1.20+ and a USB Hub for Full Time PS4 Crossover Support there is no need for this MOD so you can disable it. This class to give you the option of how you want the GamePack to notify you when the Auth Timeout is close to occurring. You have the option of being notified by LED 4 / CronusMAX PLUS Backlight LED flashing or LED 4 / CronusMAX PLUS Backlight LED flashing plus the controller rumbling. LED 4 / CronusMAX PLUS Backlight LED will Flash more frequently the less time you have until the Auth Timeout occurs. LED 4 / CronusMAX PLUS Backlight LED will Flash & controller rumbling more frequently the less time you have until the Auth Timeout occurs.